Composed by John Williams. 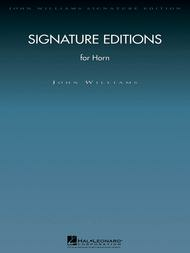 John Williams Signature Edition - Brass. Movies. 32 pages. Published by Hal Leonard (HL.4490563). 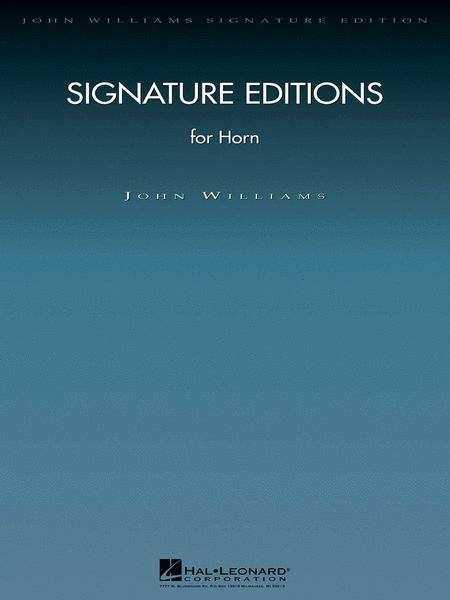 This collection includes authentic First Horn parts for twelve John Williams orchestral compositions from his most famous film scores and commissions. A thrilling addition for the serious horn player's library. Raiders March • Star Wars: Main Title • Theme from Jurassic Park • Princess Leia's Theme • Excerpts from Close Encounters of the Third Kind • Adventures on Earth (Finale from E.T.) • The Cowboys Overture • Superman March • Olympic Fanfare and Theme (written for the 1984 Olympics in Los Angeles) • The Mission Theme • Liberty Fanfare (written for the rededication of the Statue of Liberty on July 4, 1986) • Theme from Always.